Creating a digital portfolio encourages lifelong learning as students build, maintain, and sharea record of their performance over time. Inspired at the Michigan Council for the Social Studies conference, my eighth–grade students and I began collecting student drawings, photos, work, and reflections into spiral notebook portfolios. Every weekend, I took 150 notebooks home to annotate and better interact with my students. I’d be lying if I said it was the best part of my weekend, although it was always rewarding to see their reflections, creations, and continued growth. Creating a portfolio fosters a lifelong practice of reflection. Over the course of my daughter’s senior year studying architecture, she worked constantly to improve her design portfolio. Every time she gained new skills and proficiencies, she revisited past work to apply new techniques to improve projects she had already completed, demonstrating reflection, progression, and ownership! You can foster this same reflective process by providing students with rubrics to guide their self-assessment. Since my eighth–grade teaching days, technology has produced ever more remarkable systems for documenting learning. Now with Tech4Learning’s Share software, taking student portfolios home on a thumb drive is as easy as slipping my cell phone into the pocket of my purse! 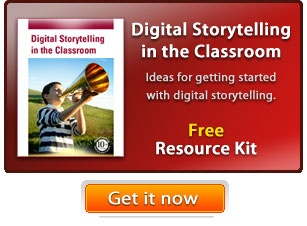 Using Share, students are able to include videos, images, podcasts, and sound – complete digital stories – into any page. I wish I’d had Share back when my students recreated the Constitutional Convention in full costume ... we could have incorporated videos of George Washington, Ben Franklin, and James Madison into their portfolios! Digital portfolios can include graphic organizers, reflections, nonlinguistic representations to explain abstract ideas, and all manner of technology project work. Students can use the recording and text capabilities to narrate answers to questions or annotate their work, providing audio and written reflection on the learning process. The beauty of digital portfolios is that they encourage students to take great pride in building, maintaining, sharing and publishing a record of their performance over time. Whether students publish their portfolios as HTML, Flash, PDF files, or printed and bound, having a wide audience makes the process more engaging and motivating. Portfolios are often a general collection of student work over time, featuring a smattering of a student’s best work across the curriculum to show academic growth over one or more years. Remember that you can also use portfolios to demonstrate proficiency in a variety of specific topics. One of my favorite templates in Share is the portfolio based on the National Educational Technology Standards for Students. This portfolio template helps students demonstrate technology proficiency in today’s digital and global world. Including project work that requires application and analysis (the top of Bloom’s taxonomy) helps demonstrate a student’s ability to think critically and creatively. With the recent addition of K12Share.com, students have a new online place to publish portfolios created in Share, giving every student the ability to share work with their family, their community, or even the whole world. K12Share also gives teachers a way to track student progress from any computer connected to the Internet. K12Share makes the weekend chore of lugging home 150 notebooks and boxes of artifacts a thing of the past!